Christmas is just around the corner, and for many families, this will mean the introduction of a new bundle of fur joy into your home! Like bringing home a baby, it can be daunting to know what to do with your new bundle, and unfortunately, if you are not prepared you can find yourself chasing your tail for a long time, and you may not be giving your pet the best chance to calmly assimilate into your family. Crate – for many this is a godsend when it comes to training. It quickly becomes the place where your puppy can feel safe, and at the same time when you’re not around so you don’t have to worry about the place being trashed! 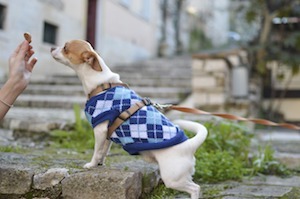 Bedding – your puppy will need clean and warm bedding from the get-go. Exercise area – make sure there is space for your puppy to exercise, and remember it needs to be out of the sun. Also if you want to confine your dog to a certain part of the house, you may want to consider baby gates to block doors. Collar and leash - essential for those long walks and training. Seat belt – these are now required in many States and can save the life of your dog in the event of an accident. Training tools - These days, training is all about rewards and not punishment. Most importantly, there is no point punishing a dog for something after the event – it will not have a clue what the punishment is about – you need to catch them in the act! Clickers are used as a prompt for training, but they only work with a reward – generally, food as most dogs are motivated by food. Boredom busters – dogs are social animals and love it when you play with them. Think about getting some balls, and fetch toys. Also if he is alone a Kong which is like a rubber beehive can be used as a toy or will keep your dog occupied for hours if you stuff it with treats! Grooming tools – think about stocking up on combs and brushes (get some advice from your groomer or vet), shampoo, conditioner, scissors, nail clippers and toothbrushes. When you groom your puppy early he will get used it and don’t forget to give him a reward so that he looks forward to it in the future. Pooper scooper – no pet owner should be without a pooper scooper, and/or doggie bags to “do the right thing” when you are out and about. A vet would be at the top of the list, and one of the first things you would do is sign up for puppy school – these are often promoted and managed through vets. If you are going to be out a lot, you may want to identify a dog walker or daycare. Ask your friends and your vet for recommendations – it’s a very important decision – and don’t be afraid to ask for references. Pet Insurance – it’s best to get pet insurance sorted whilst your puppy is young – that way you avoid pre-existing conditions being excluded from your policy. For most policies, once covered your pet can be covered for life. But do check the terms and conditions carefully. 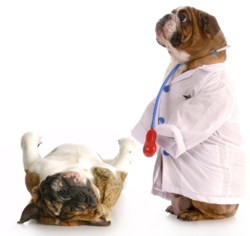 Here are some things to consider when choosing your pet insurance. Microchip – this can be a lifesaver, especially when your puppy is young and may have a tendency to go AWOL. If you get your dog from a breeder this is usually done in advance, but if not, your vet can oblige. Make a note of the microchip number and keep it safe. Microchipping is mandatory in most States in Australia. Lost Pet Finders – don’t forget to register your new furball with Lost Pet Finders. It won’t cost you anything, and in the event your puppy gets lost Lost Pet Finders will activate an army of pet lovers in your area to be on the lookout so you can be reunited with your furball as soon as possible.